We develop our business strategy taking into consideration where our company is within its life-cycle. If the company currently regards itself as a market follower, which allows others to dominate in the market, we need to position (means “adapting to current circumstances”) our strategy in line with the changes happening in the macro and micro environments. If it is one of the market leaders, we consider being more aggressive by constructing (means “creating something new”) the organization’s own future from within. So we have two options to choose between: our company uses either Follower strategy or Leader strategy. Both options can be great if applied appropriately. 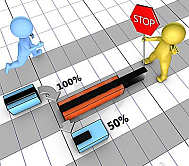 Both use different scenarios and require different project management approaches. Or we employ adaptation as the primary tool for navigating our company through an ever-changing environment (“the Follower-through-adapting” scenario). Or we transform our external and internal policies to seek a winning collaboration scheme with other top players in the market (“the Leader-through-transforming“). This picture below shows both approaches and their possible scenarios. To make the right choice, we need to clearly realize how much confident our company in its ability and desire to predict changes or how well it can handle uncertainty. Everything depends on how deeply and accurately the company needs to forecast its future activities. This is exactly the place where predictive and non-predictive approaches of project management come up. As shown above, both types of business strategy employ different scenarios. 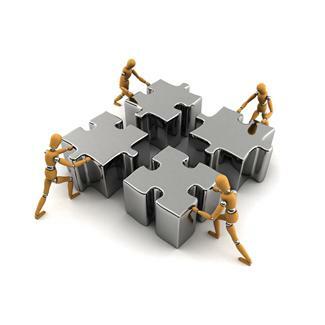 Project management is key to managing strategic business planning initiatives. 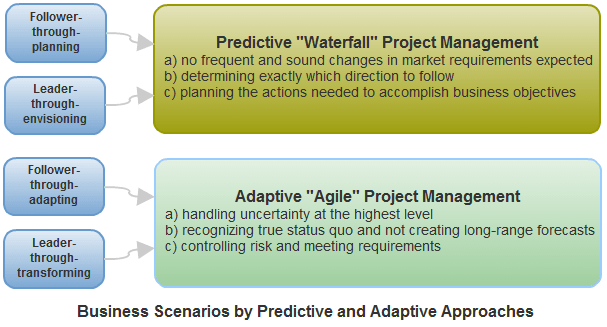 Some scenarios let use predictive (traditional “Waterfall”) project management, while the rest scenarios employ adaptive (iterative “Agile”) approach. The Follower-through-planning scenario assumes that by using comprehensive planning and long-term forecasting an organization can handle uncertainty at lower levels, where vital success factors are observable and predictable in the long run. If we employ this scenario as the primary tool in predictive strategic planning, our company can position itself right where the market is heading, with a clear idea about the end outcome but without “regrets” to unsatisfactory progress. In this case, both the cycle of actions we do and the market feedback we gather will take a relatively long time to complete. 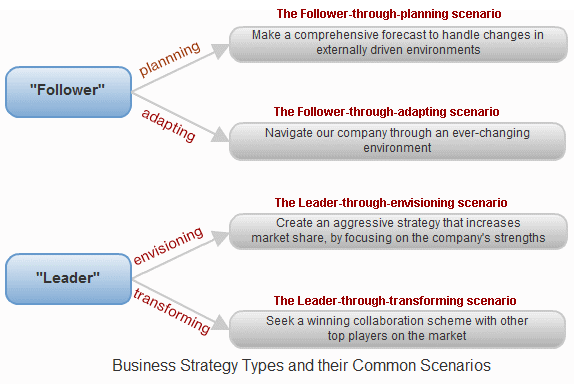 Likewise, the Leader-through-envisioning scenario allows using aggressive strategic planning to predict the end result and create a vision of how a business organization is going to achieve this result. This scenario takes less focus upon intermediate steps but keeps the company moving toward the final destination point. 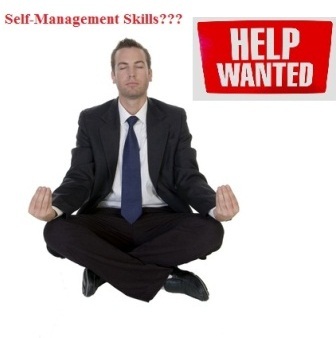 Such a company should have great resources (strengths) to efficiently struggle in competitive markets. So, the Follower-through-planning as well as the Leader-through-envisioning scenario allows employing a predictive “Waterfall” approach of project management that: 1) assumes no frequent and sound changes in market requirements are expected; 2) focuses on determining exactly which direction to follow; 3) and defines the actions needed to accomplish business objectives. The Follower-through-adapting scenario involves an organization in taking their actions incrementally, by shortening the foresight horizon and recognizing where they are now. And there’s no necessity for the organization to forecast where they’ll be tomorrow or next week. The organization has to deal with a higher level of uncertainty caused by frequent market feedback loops and short action cycles. Similarly, the Leader-through-transforming scenario entails that management controls or drives the market situation. 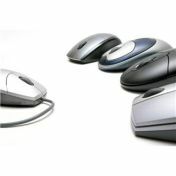 Rather than just navigating in an externally driven environment, a leading company creates and controls market demand. As such, this company deals with the highest levels of uncertainty and their project stakeholders have to commit much of their resources to help shaping the desired end result. Both the Follower-through-adapting and the Leader-through-transforming scenarios are non-predictive and adaptive to incrementally handle higher levels of uncertainty. They don’t create long-range forecasts but recognize true status quo in order to control risks, satisfy customer needs, and then move on to the next step. This behavior is relevant to Agile project management. Traditional “Waterfall” project management attempts to predict the future in order to manage uncertainty and risk at a lower level. This approach lets use predictions as the key to successful project development and delivery. 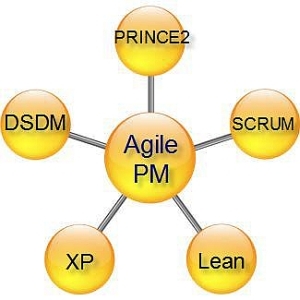 Agile project management aims to control the current situation through multiple iterations per project stage and high-level adaptation. We can use incremental development approach to adapt to changing requirements and therefore efficiently handle uncertainties. Although both approaches are different, they can be related to each other, taking into account the assumption “what can be predicted can be controlled.” In real life, business organizations try to combine the ideas of both approaches in their business strategies in order to successfully compete on the market. The relationship between Waterfall and Agile gets stronger when the foreseen horizon of business development appears relatively certain. However, as the company deals with changing uncertainty, it becomes harder to relate prediction and control with one another. Measuring the reliability of predictions in terms of the available details, incl. business specifications, technical documentation, lessons learned from past projects. Considering these items, business case can be used as the cohesion tool to relate both approaches to one another. The business team and project managers can create a business case for each approach, then compare each one against the requirements of time, cost and quality.